Solve puzzles and loot Nornir chests while working the inside of the mountain. 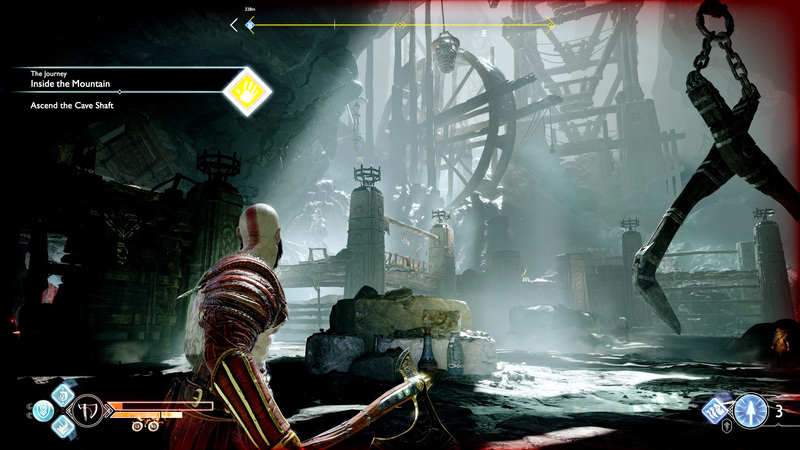 Inside the Mountain is the fifth story mission in God of War, and it’s filled with lots of little puzzles and riddles that gamers will need to solve. It also introduces new gameplay mechanics that will change how Kratos and Atreus handle certain situations going forward. Head up the mountain until the path is blocked, then jump to the rock face and start climbing. Reach the top and deal with the black breath, moving forward until things get brighter. 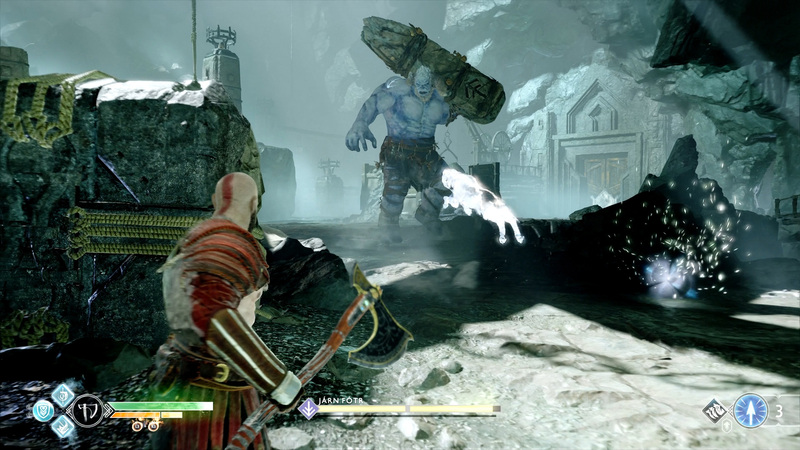 Pry open the door in front of Kratos and Atreus, then walk toward the statue with antlers. There’s not much to do here just yet, so walk into the room on the left. Fight through the enemies that attack, and take note of the blocked door further ahead. This cannot be dealt with yet, so turn back, keeping a close eye on the ceiling. There is a Light Crystal up there that must be knocked down, picked up, and placed in the free slot in the other room. Have Atreus shoot each of the Light Crystals with Light Arrows, then move the lever back to solve the puzzle. Move forward through the caves, taking the stairs on the right when they appear. Having Atreus shoot the Light Crystals helps brighten things up. Loot the casket at the top of the stairs and then head back down. There is a large pillar blocking the main path that must be moved, followed by a Revenant and some Nightmares that must be dealt with further ahead. Hop up on the small ledge to deal with several more enemies, then look around for some boards that can be smashed with the Leviathan axe. There is a Light Crystal behind it, and Atreus can form a bridge if he shoots it with Light Arrows. This bridge will lead to a Nornir chest that can be opened. The three seals are found just past the spot where the Revenant spawned, up on the ledge and near the bridge leading to the Nornir chest, and tucked behind a rock across the bridge and south of the Nornir chest. The solution to the puzzle is written on the wall behind it. Just past where the Revenant appeared is a fork in the path to the right. There is a Light Crystal just beyond this path. If Atreus shoots it with a Light Arrow it will form a bridge and lead to another casket with some loot. Next to the bridge that Atreus created to lead to the Nornir chest is a Light Crystal. This can be carried across the stone bridge to the south of the Nornir chest and placed in the slot to reveal some additional lore. 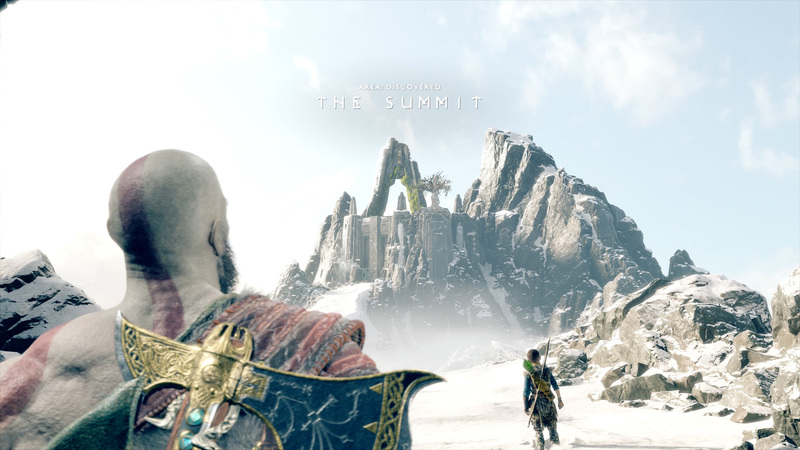 When everything has been investigated and dealt with, head for a room to the north that requires Kratos and Atreus to crouch-walk to progress. This will lead to the area behind the statue with the deer antlers. Loot it and read the lore, then open the giant double doors to move forward. Through the doors will be some enemies that need to be dealt with, and further up the path will be a section of wall made of wood. On the other side is a casket, and there is a crawl space close by that leads to it. Loot the casket and return to the main path, then climb the wall and hop over to the next section. Be sure to lower the nearby chain to make ascension easier in the future. 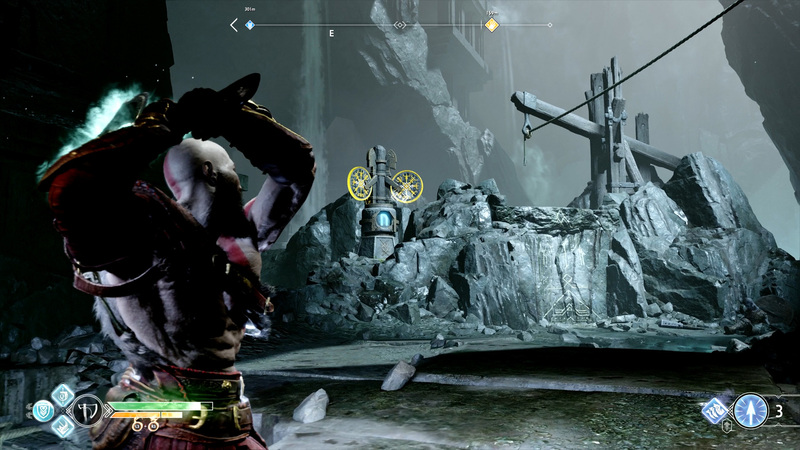 There is a second chain a very short distance up the path and lowering it will allow Kratos to loot a chest with some Hacksilver in it. Do so, then move further up and turn the wheel to open the door to the next area. This is an overwhelming area when Kratos and Atreus first arrive, but it’s manageable. The goal is to move the large claw in the middle, but in its current state that is impossible. Before getting to that, look between the wheel and the Hidden Chamber in this area for a narrow passage. 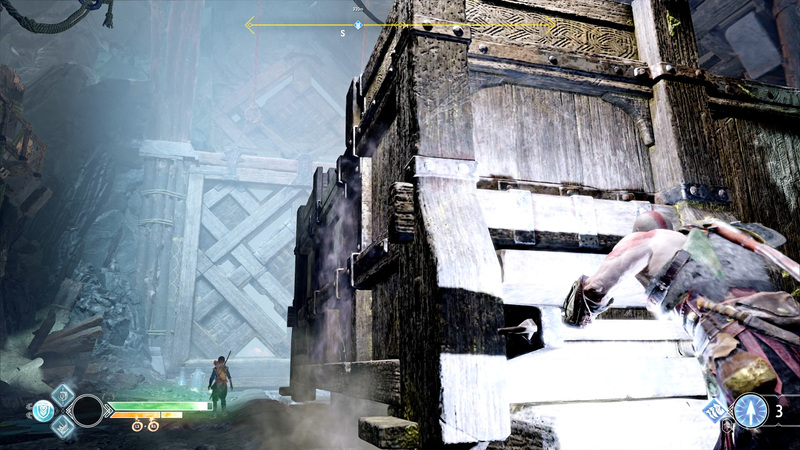 Squeeze through and loot the chest in there for some Solid Svartalfheim Steel. That’s all there is to do there, so head back out to the main room and interact with the wheel. Several enemies will spawn that need to be dealt with, but they will open a path to solve the problem of the chain that’s stuck. First, smash a wooden barricade to the left of the tunnel they emerged from to loot a chest for some Hacksilver. Head down the tunnel to find Brok, ready to buy and sell goods, or perform upgrades for Kratos. Take note of a crawl space near Brok that leads to a chest and a casket. Loot both before hopping back onto the main path, which is blocked by huge spikes of death. Throw the Leviathan axe at the mechanism to the right of the spikes, then run through before they close. Another door will be just ahead of that. 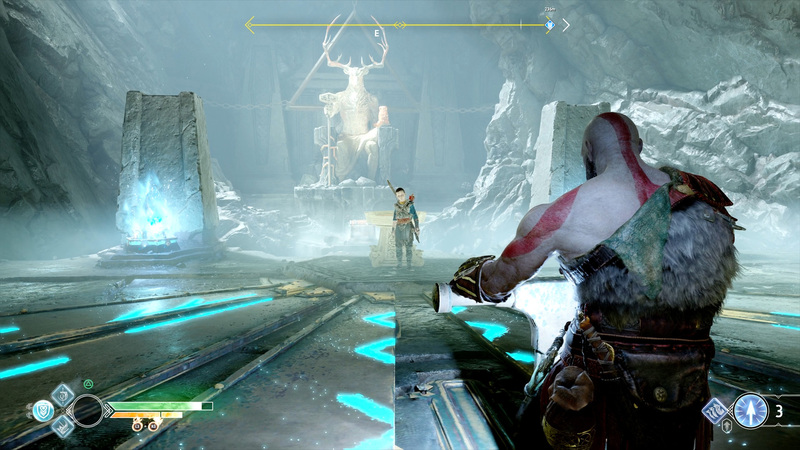 Throwing the axe (twice) at the top-right of the door will push it open so Kratos can pass through. This new room has more enemies, so it’s best to deal with those before working on any puzzle-solving to progress the story. Loot the ground when they’re gone, then approach the giant cart in the room. There is a mechanism that must be destroyed first, then move it along the rails a short distance. Climb on top of the cart and use it to reach the second level of this room. Break the two mechanisms above the wooden bridge on the second level, dropping it so Kratos can cross to the other side. Cross the bridge but look for a spot to drop down where a casket can be looted. Lift the nearby door to get out of there. Kratos will now be back on the ground level. Hop back up on the cart, climb to the second level, then cross the bridge again. This time, deal with the enemies standing at the far end. Kick the chain down, then destroy the mechanism above a second bridge to lower that one as well. Deal with the few enemies on the other side of this bridge, then climb up a couple of times to find a casket that can be looted. Kratos should now be back to where he originally climbed up on the cart. Smash through the nearby wooden barricade and go through the tunnel. Lift the large pillar out of the way, then drop the nearby chain down for future access. There is another chain here that’s used to open the door that will allow Kratos to move the cart through to the original room. Lift the chain, then lift the nearby door in this area. Hope down, then push the cart through until it’s lined up with the platform where Kratos pulled the chain to lift the door. Hop back up onto the cart and use it to jump the gap to the platform across from the one where the chain was pulled to lift the big door. On this platform is a chest, as well as a large boulder at the far end. Interact with the large boulder. Hop down to the ground level and prepare to fight Jarn Fotr, a troll. He’s not unlike any of the other trolls Kratos has faced at this point. He carries a big stick that he likes to swing and smash to the ground, and he will stomp when someone is under his feet. If he has one attack that is different, it’s that he can also stomp his feet and send a wave of ice shooting through the ground. Evade if he does this. My preferred method of dealing damage to Jarn Fotr was to bait him into a ground smash with his wood plank, rolling behind him as he did. I’d then unleash combinations to deal damage, and then scoot out of the way as he recovered. Throwing the Leviathan axe from a distance will also work, although it’s a slow way to win this fight. Pick up the loot that the troll drops, then move over to the wheel and turn it. When the wheel can’t be turned any further, throw the Leviathan axe into the gears to hold it in place. Now go retrieve the cart and push it along the tracks and into the claw. Hop on the cart, recall the axe, and then enjoy the ride. Move forward towards the flame shooting across the path. Time it so it’s just ending as Kratos passes through safely. The second set is tougher. 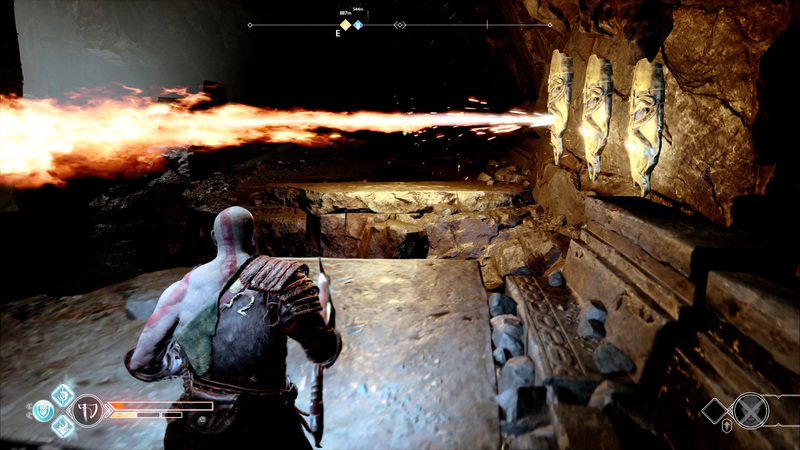 As soon as the furthest flame from Kratos activates, jump over the gap to pass the second test. The third is the worst, but still manageable. The center console will spin counterclockwise and shoot flames. Move counter clockwise, using the environment to stay out of the fire. Head for the wheel on the far side, killing any enemies that spawn in along the way. Spin the wheel to lower the center console and suppress the flames. Don’t forget to loot the casket. Further along will be two large boulders, one to the left and one to the right. Push both off the edge to start the lift moving. There will be interruptions to this ride. The first will be lower-level enemies that can be easily booted off the edge of the lift in bare-handed combat. Just sprint at them and press R2, then get the ride moving again, although another interruption isn’t far off, this time in the form of an ogre. It’s a tougher fight, but it’s not Kratos’ first ogre and should be straightforward to handle. Dodge and parry, then smash this fool with various attacks. The third and final interruption of this ride is a bad one. A dragon named Hraezlyr will attack, and this fight can be very tough. Start by dodging its attacks with its arms. After a successful dodge, approach its hands and deal damage. After a small amount of damage, the fight will become scripted, and all Kratos must do is hit the indicated buttons in a timely fashion. A short distance up the path the game will introduce Shatter Crystals and explain how they can be used to clear World Tree Sap obstacles. Grab a Shatter Crystal, then throw it at the obstacle blocking the path. The Shatter Crystal will explode and clear the obstacle. This is a game mechanic that must be mastered for an upcoming fight, so take a minute to get it sorted, then move along the path until triggering a cut scene. Break left as instructed and run along the path. Jump onto the dragon and wait for further instructions. When Kratos finds himself in the dragon’s mouth, use R2 and R1 to alternate between attacks. This will lead to the fight opening up, which is where the Shatter Crystals come into play. Avoid Hraezlyr’s attacks by dodging out of the way. Notice that this dragon is sometimes electrified, and that’s what Shatter Crystals require to explode. Look around the perimeter of the fighting zone for Shatter Crystals, then throw them at the dragon to cause damage. A successful hit will stun the dragon and knock it down, exposing a wound that Kratos can attack with melee combat. Smash Hraezlyr until it wakes and returns to its active state. Hraezlyr will reposition and begin attacking Kratos by slamming its claws down in the fighting area. Evade these, then use melee strikes to its limbs. Kratos must also be careful of a slam from Hraezlyr, as it sends a shockwave through the ground that will knock him off balance. This can be blocked with the shield, though, so it’s not much of a threat unless it directly strikes Kratos. Take note, however, that Hraezlyr is not electrified, and therefore the second stage of the fight should not involve throwing Shatter Crystals. These two stages will alternate a few times. When electrified, throw Shatter Crystals at Hraezlyr. This will knock the dragon down and allow a damage phase. When the dragon is not electrified, avoid the swipes from its claws, then strike out at the limbs. Just be sure to keep an eye out for the dragon’s attacks and avoid them as necessary. After about two thirds of Hraezlyr’s health is gone, a short cinematic will hint as to how to end this fight. 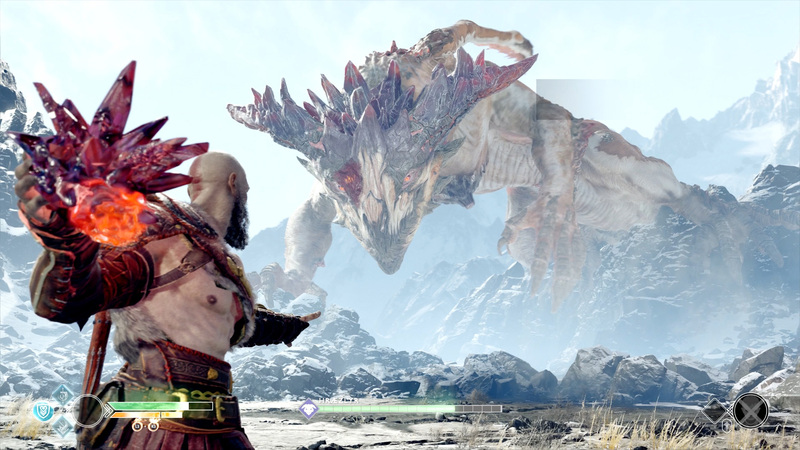 Kratos must get close to the beast, avoiding its attacks and dealing damage to its claws. This will provoke its electric attacks, which will once again allow Kratos to strike with Shatter Crystal throws. When the dragon is stunned, approach the open wound and unleash attacks, then press Square when prompted on the screen. The game will now explain Shock Arrows, which can be used to destroy Shatter Crystals and clear World Tree Sap obstacles. Atreus can swap between Light Arrows and Shock Arrows by pressing up on the d-pad. Instructing him to shoot is the same (Square). Luckily, there is a World Tree Sap obstacle with a Shatter Crystal nearby to test this on. Head into the cave and continue along, keeping an eye out for a path on the right. Have Atreus shoot a Shock Arrow at the Shatter Crystal, clearing the World Tree Sap obstacle from it and allowing Kratos to loot the chest. Head back to the main path and climb the wall. Clear out any enemies at the top, then have Atreus shoot the Shatter Crystal. Use the wheel to raise the basket with the Shatter Crystal in it, then have him shoot it again. Kill any enemies that spawn, then climb up the wall to the left of the basket with the Shatter Crystal in it. Kill the enemies ahead, then explore the open wall to the right before climbing up on the short ledge. With the main door blocked for now, follow the hallway as it loops around, ducking into the room on the right to investigate the Jotnar shrine. When ready, enter the main room and take out the three enemies in there, one of which is a step up from the other two, but still manageable. When the room is clear, grab the Shatter Crystal from nearby and throw it against the World Tree Sap obstacle stuck to the bridge, then have Atreus shoot it with a Shock Arrow. There are two obstacles, so repeat this process twice to fully lower the bridge. This is the path forward, although there is a Nornir chest that needs to be dealt with first. The three seals for the Nornir chest are hidden around the bridge. While crossing the bridge, look right to find the first one tucked in the wall. The second is found by raising the bridge and locking the gears into place, then crossing to the upper level. It’s just on the right, while a casket is on the left. The final seal is in the same room as the Jotnar shrine (before Kratos ever reached the Nornir) chest. Smash all three and loot the chest to get an Idunn Apple. Push forward until reaching a wall that Kratos must climb, then pry open the big double doors. Quite a few enemies will block the narrow path, but this is another perfect opportunity for bare-handed combat. Sprint at enemies and press R2 to kick them off the mountain and progress forward. Once at the base of the mountain, climb it and work around until finally reaching the summit. A cinematic will play that will end this chapter. That does it for the Inside the Mountain chapter, which means it’s time for A New Destination. Of course, all our guides can be found at our God of War walkthrough and guide.